Reprinted from the Spring, 1985 issue of The Deerhound Club newsletter. 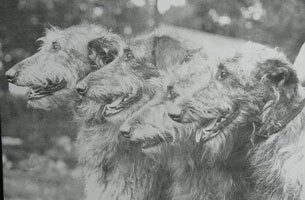 Copyright The Deerhound Club. Reprinted with permission. Many thanks to The Deerhound Club for the use of their materials. 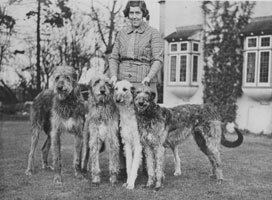 I first met Marjorie when I went to buy my first Deerhound puppy. We were made very welcome and were given help choosing our eventual show champion, Osbert of Enterkine. 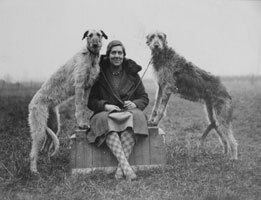 Now no one ‘chooses’ to call their one and only Deerhound Osbert (apologies to all Osberts reading this – nothing personal) so when asked by Marjorie what ‘pet’ names we had thought of my Son came up with Hamish and Scooby Doo. A blank stare followed by a lecture on the aristocratic background of the breed led us to believe that Hamish was perhaps the more favourable choice – so Hamish it was. As she lived not far away at the time we began to visit her quite often. While my husband was deftly cajoled into cutting down the long grass and weeds in the dog runs I walked the dogs. The first time I went walking I was told to keep turning left at each junction and I would eventually come back to the bungalow. No one told me it was a 4 1/2 mile round trip and about a mile out it started to pour with rain. Thinking I was almost back I kept going and arrived back at Marjorie’s soaked to the skin. She met me at the door with a couple of large towels and I gratefully began to dry myself. My relief was shortlived when I was told in no uncertain terms that the towels were for the dogs, not me. Only once the dogs were dried and put away was I able to sort myself out. When we moved to Scotland Marjorie often used to visit us and a more delightful guest would be hard to find. 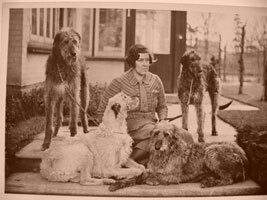 She was easy to please and entertained us with her remarkable memory of dogs past and present. On one visit, I made her usual morning cuppa and went to take it to her bedroom. Hamish refused to go through the kitchen door, however much I pushed him from behind. I put the teacup down and gingerly peeped outside the door with the feeling that someone was going to say ‘boo.” However there was no one there and I carried on upstairs to Marjorie’s room. “Did you come to my room at 2 o’clock this morning?” was the first thing Marjorie said. I said no. “Well, two women came in my room at just past two this morning.” l must explain that because of Marjorie’s age and weight ( ! ) she slept slightly propped up on pillows. On the bedside table was her small suitcase and on top of that was her travelling alarm clock, her torch and a glass of water. “l thought at first that you had brought someone to meet me and thought what an odd time it was when I looked at the clock. However, the woman in front walked towards my suitcase and went to open it. I then reached for my torch and asked her what she wanted. The one in front turned and said to the other, ‘She’s seen us, let’s go.’ At that they left the room, shutting the door behind them, and I heard them going down the back stairs.” Burglars, I immediately thought, but Marjorie’s description left me dumbfounded. The women were wearing ankle-length skirts in some dark material and the one at the back had on a white ‘pinny’ and a sort of maid’s cap. I immediately went to check the rest of the house. Nothing seemed to be missing. Now, Westerton House was built within a dry moat. The basement windows were barred and the only basement entrance was locked, barred and bolted. The ground floor windows were 12′ from the ground, and locked, and the only door left, the front door, was also locked and bolted. So where did Marjorie’s mysterious visitors come from? The day before I had had an Edwardian wardrobe and dressing table delivered. Did something (someone) else come with it too? This experience was never repeated but I wonder if Hamish could have talked would he be able to tell us who was outside the kitchen door? Marjorie was registered disabled during the latter years of her life. That disabled sticker got us super parking at the SKC. On one occasion, while having driven herself to a dog show, she returned to the car to find an irate gentleman complaining about the dent in his passenger door. Marjorie denied all knowledge of this but he persisted in his accusations. Marjorie got into her driving seat and demonstrated, by opening her door, that in no way did her door touch his door where the dent was. In fact, it touched his door a good 4 inches above the dent. He couldn’t argue with this fact so drove away quite bemused. Marjorie didn’t hurry though, she waited for the return of 3 friends who had come with her. It was a good job the neighbouring car had gone because on their arrival it was easily seen that they were all of similar build to Marjorie. Now, with the weight in the car increased three fold Marjorie drove away smiling to herself – with the car about 4 inches lower to the ground. Wonderful memories, wonderful lady. We miss her dearly.